The state of Kerala has experienced the worst flooding in a century. Lives, houses, infrastructure and several cash crops have been lost to the floods. World Vision India has rushed emergency relief to children and families affected by the floods in Kerala. So far, we have been able to reach 4217 households. In the first phase, emergency relief assistance will be distributed in five districts; Wayanad (3000 families), Pathanamthitta (1500 families), Kottayam (3000 families), Malappuram (3110 families) and Palakkad (1000 families). World Vision India plans to provide emergency relief to around 20,000 families in Kerala over the coming days. Our target sectors include Food, Non-Food Items, Education, Child Protection, Education, Shelter, Livelihood, Water, Sanitation and Hygiene. World Vision India’s staff and volunteers are engaging with children through child-friendly spaces with storytelling, song, dance, colouring, sport and other programmes. 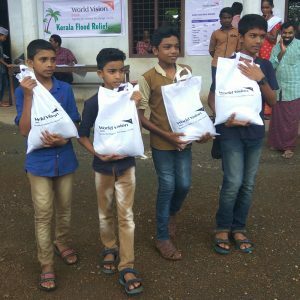 Around 600 children in five relief camps in Wayanad, 350 children in 14 locations in Kottayam and 500 children in Malappuram took part in this. After our emergency response of about 90 days, we will move into the recovery and rehabilitation phase for a duration of 18 months. 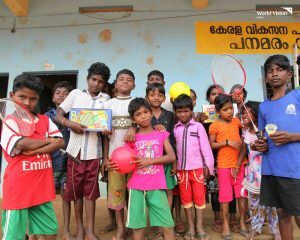 Join us in rebuilding the lives of children and families in Kerala. Click here to help. I am trying to make a contribution but the website is not opening when I click the “HERE” link.